If you are a Canadian citizen between the ages of 18 and 35, you may be eligible for a Working Holiday visa. These visas are issued as part of the International Experience Canada (IEC) visa program. Some countries also offer special visas for young professionals under the IEC program. Working Holiday visas allow young Canadians to work while visiting any one of over 30 countries worldwide, in Europe, Latin America, east Asia and the Pacific. You can view a list of participating countries here. If you are an international visitor to Canada with an IEC (Working Holiday) visa, please visit our IEC page. The aim of this program is to allow young travellers to ‘earn while they travel’. Common examples include teaching English in Japan or Korea, working in the outback in Australia, working at a pub in London, being an Au Pair in France, or working at a hotel on a Greek island. Application requirements vary by country. Generally, you will be required to prove that you have sufficient funds to support yourself, and that you have comprehensive medical and repatriation insurance for the entire length of your intended stay. You should apply for a visa before leaving Canada. Depending on the country that you are choosing to travel to, there may be no insurance required to gain entry into the country, unlike IEC visa holders coming into Canada (who are required to buy private travel insurance and keep it in place for their entire stay in Canada regardless of whether they become covered under provincial health care). That said, it is still a wise idea to ensure that you have purchased travel insurance for the entire time that you will be away. If something happens, you don't want to have to rely on your travel funds to pay for medical expenses, or to tap into the bank of Mom and Dad. 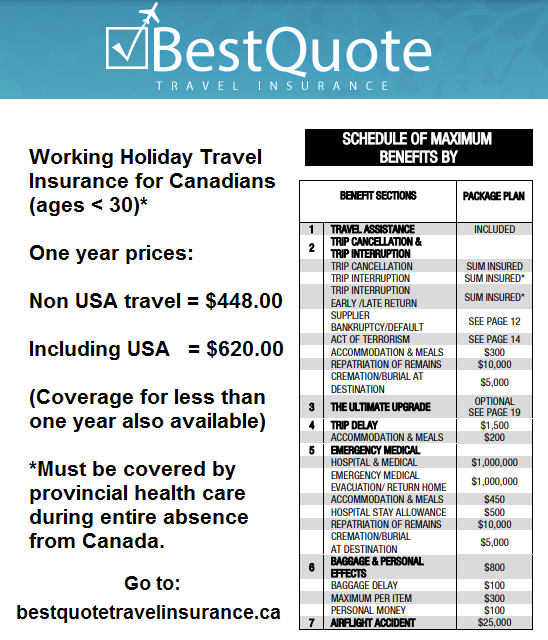 For Canadians travelling abroad, comprehensive coverage can be obtained for a cost of only about $40/month. For only $448/year, someone less than 30 can be insured while in Australia, Japan, Korea, or Europe, or anywhere else that doesn't include USA travel. Option 1: You are a Canadian Resident Covered by a Provincial Medical Plan. Choose ‘Canadian Travellers’ and then ‘Emergency Medical’. Remember that you must get a waiver from your provincial medical plan to remain covered if you are leaving Canada for more than six or seven months (varies, depending on your province of residence). Check our 'Info' and 'Links' tabs to find contact details for your povincial medical plan. Option 2: You are not a Canadian Resident or have lost your Provincial Medical Plan Coverage. Choose ‘Global Expats’ and then ‘Canadian Expats’. If you are from BC and do not want to continue paying for MSP, you can request a 'suspension' of your MSP coverage for a year, and purchase an Expat Policy. This is often cheaper than paying for both MSP and Canadian travel insurance. Your quote will display prices, along with important policy details. Further details can be found by clicking on the blue 'summary' button, which is displayed underneath each policy on your quote. Getting a quote is the best way to research your insurance policy options! You can find further information about policy options under the following tabs on our website: Expats & Backpackers, Allianz Youth Adventure, Travelance Youth Travel Insurance. If you have a specific question or need more information, please call us toll-free at 1-888-888-0510.